Today’s horticulture calls for an environment continuously monitored and controlled for optimal quality and production. Your MicroCool fog system provides the tools you need to maintain even, constant temperature and humidification – integrated with your climate computer to work in concert with your ventilation system and other control elements. In hot, arid climates, grow successfully through the summer months with the maximum cooling potential. In colder climates, maintain optimal humidity to maintain nutrient uptake and plant health through the heating season. See how humidification reduces plant stress. Control the propagation of young plants and seedlings by maintaining constant humidity levels. The correct environment allows faster and more even rooting for maximum output. View video showing a commercial propagation greenhouse. Grids of nozzles are positioned strategically throughout the greenhouse. Billions of 10-micron water droplets instantly flash evaporate to cool the air and add humidity, based on your plants’ needs. MicroCool’s anti-drip nozzle design ensures that there are no drips or excess drain water that can damage crops if not controlled. Stainless steel or flexible nozzle lines provide versatile design options and make installation a breeze. MicroCool fog systems deliver an unrivaled level of performance, quality and control. Integration with climate control systems— Take advantage of the manufacturer’s fog “programs” built into your climate computer. Versatility— Wide array of pumps and systems, can meet the needs of greenhouses of any size and complexity. Zone and sector controls— Create different conditions in various zones throughout the greenhouse. 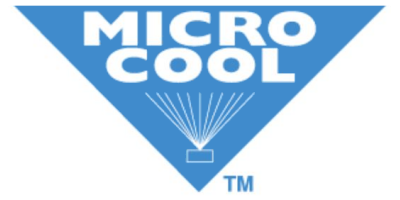 MicroCool precision FOCUS system— Perfect for germination and transplant rooms without any wetting. Non-drip nozzles— No marks or discoloration on fruit or leaves. 360º nozzle orientation— Allows nozzles to be positioned where you need them, stops nozzle lines “twisting” on startup. Integral “last-chance” filter— Protects nozzles from materials that could get into the line. Can work with Reverse Osmosis water— Reduces nozzle blockage by keeping them clean, and maintains 100% output of the system.